Write a TSW. A Technical Scope of Work (TSW) describes the test experiment in detail and outlines an agreement between Fermilab and the experimenters on what resources are needed. Obtain ID. A Fermilab ID number is obtained by the spokesperson for the test experiment first in order to assign an experiment number. All experimenters in the group must have a Fermilab ID. Get on schedule. After several revisions, with details added to the TSW document, the user will be placed on the facility calendar by the facility coordinator. TSW approved. The TSW must be approved before the user will be allowed to begin installing equipment. Training. All on-site users on the experiment need to go through the proper training. Some of the training can be done before arrival, and other training must be done on the first day at Fermilab. Operational Readiness Clearance. All equipment must be reviewed for operational readiness after it has been installed but before it can be operated. All of the above steps must be done before the user is ready to work in one of the R & D facilities. Experimenters must have a Technical Scope of Work (TSW), which describes the project in detail the is appropriate for the scale of the effort. 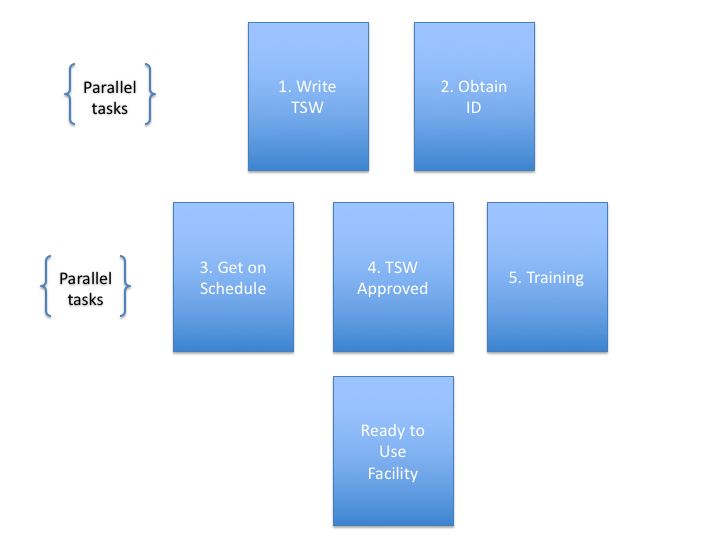 A TSW is a written plan put in place to establish a clear understanding of how an experiment will practically function and each party’s roles and responsibilities. The preparation and consideration of a TSW for each test effort helps the facility be flexible and meet the goal of equal access to the facility for all detector tests with relatively low bureaucratic overhead and a guarantee of safety, coordination and oversight. The TSW is signed by the project leader and acknowledged by Fermilab division heads and associate directors. The scope of work is not considered proprietary information and is publicly released. The project leader is the experiment’s official contact and is responsible for forwarding all relevant information to the rest of the group, arranging for their training and getting the necessary approvals for the experiment to run. The TSW is prepared using an online system described here. The person filling out the TSW needs to have a Fermilab Services account to get started. Example from the previous word document based system are here. Tests using the Neutrino Division facilities are sponsored by the Neutrino Division, so please check that division as the host division on the form. The “Spokesperson” for your effort is the person leading the test as that person is to be the main point of contact for the facility manager, safety review panel, and R & D coordinator. That is still true even if the test is being done for an approved Fermilab experiment such as DUNE; please do not list the DUNE spokesperson as the “Spokesperson” for your test. Please indicate the financially responsible entity in the appropriate location on the form. For generic R & D projects, that entity will be a combination of the Neutrino Division and the home institution of the project proponents. For projects supporting an approved experiment the entity will be the experiment/Project. Please communicate with the Neutrino Division R & D coordinator to determine the appropriate financially responsible entity. It is highly recommended you include as many pictures of your apparatus as possible, including photos, diagrams, mechanical drawings, etc. Pictures of apparatus and set-up are greatly appreciated and will improve the Operational Readiness Clearance process (ORC). Be sure to identify any potential hazards such as the use of lasers, radioactive sources, high voltage, etc. If using the Blanche or TallBo facilities, please check the appropriate one as your “location” under the options for the Neutrino Divsion. You do not need to provide the dimensions of those cryostats on the Hazard Checklist. These cryostats have been cleared for use as a pressure vessel. There are known costs for operating the Blanche or TallBo facilities which should be captured in the table of costs. A single use, that involves opening the cryostat, inserting equipment, closing the cryostat and filling it with liquid argon requires approximately $1800 in materials costs as well as 1 FTE week of technician effort. Your tests may incur additional costs in either materials or effort, but that number should be used as a baseline. To work at Fermilab, every user in the group needs to have a Fermilab ID number. Please follow these instructions for obtaining an ID. Much of the process can be done before you arrive at Fermilab the first time. The TSW approval process varies according to the complexity of the scope of work. Some TSWs can be approved by the facility manager, while others may need to be approved by the appropriate division heads and the directorate. This process can be as short as a few hours to several weeks, depending on the resource negotiations between the requestor and Fermilab. The facility manager (indicated on the facility page) will help you identify the correct routing for obtaining TSW approval. The facility manager will also give you feedback on the TSW so that it has the easiest path through the approval process. Read all information about Safety training. Before a physics experiment or R&D test experiment can operate, it needs Operational Readiness Clearance (ORC) approval. Experiments or apparatus with pressure vessels, cryogenics, large mechanical structures or certain other complex components may require review by other specialized committees as well. An accurate and clear description of possible hazards in the TSW is critical to determining which reviews are needed early on. The controlling document for the ORC process is FESHM 2005. Read more about practical tips and guidelines.